I’m looking at getting my classroom displays sorted and I came across the PowerPoint put together with letters of the alphabet – each with maths words starting with each letter (not sure who put it together but its fab! so Thank You! and if it was you can you let me know so I can give you the credit you deserve!) and when I was looking at it I thought I’d use the content as bunting across my classroom. 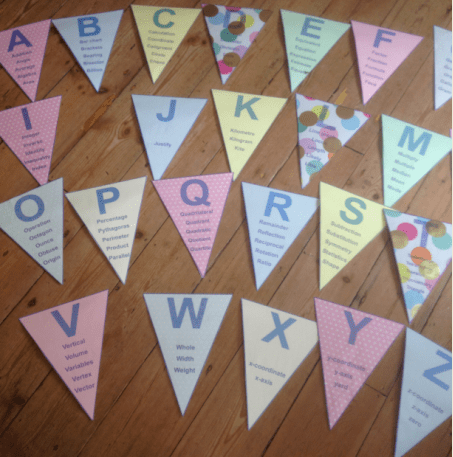 In the Summer our school governors treated the staff to an old fashioned tea party, complete with bunting and I loved the idea – it was so very pretty and girly! 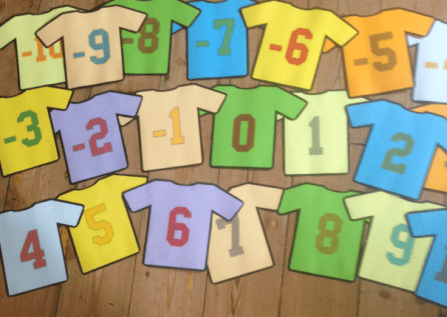 As it turns out Jessica Hocking (@tweetinghock) had tweeted the idea back in May and Hannah (@missradders) has blogged about making a similar thing here, both with maths pictures on rather than the words but the principle is still the same, so hat tip to both of you … I’m not claiming its an original idea! All in all, a good start but absolutely nothing for my masses of display boards .. oh well tomorrow is another day!